Watch the VT Folklife Center's Vermont PBS Plus special entitled "Artists' Medium". Featuring four regional artists, the segment brings viewers into "a day in the life" of each artist. "Travel to the Adirondacks with TJ Cunningham for a day of plein air painting, explore the hills of Addison County with landscape painter Anne Cady, wander through quarries with sculptor, David Wade, and visit painter Rory Jackson at his studio in Bristol, Vermont." Many thanks to Ned Castle for this wonderful collaboration. Watch the interview with Anne on WCVB (ABC affiliate) in Boston which first aired May 14, 2014 on the "Chronicle". The Wall Street Journal, with the headline: Art for Small Apartments and Budgets. The works sold at New York's Affordable Art Fair run on the compact side. "Our apartments tend to be small here," said Cristina Salmastrelli, the fair's director. In contrast with similar sales held in Amsterdam, Hong Kong and Stockholm, New Yorkers are more willing to purchase "works that you have to look at and spend time with to learn to love," Ms. Salmastrelli said. The fall fair, which takes place over the weekend, includes painting, photography, sculpture and mixed-media works from 57 galleries world-wide. "New York City loves photography," Ms. Salmastrelli said. "We make sure we have photography on site." Works for sale start at $100 and cap at $10,000, with half of it priced under $5,000. The average price is $2,000-$3,000, tens of thousands of dollars below the prices at major art fairs and auctions. Vermont landscapes are traditionally rendered in a fairly monochromatic palette — shades of green — with an iconic red or white barn. Anne Cady’s Vermont has undulating hills that look like creamy pink sherbet or multicolored patchwork quilts. 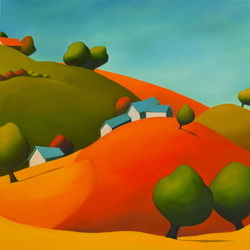 A barn might be blue with an orange roof, while a stand of purple trees resembles gumdrops. Magenta trees lean in the wind at the edge of an orange field. Cady’s landscapes don’t look real, yet they are recognizably Vermont. Cady is a tall, slender woman with shoulder-length silvery hair. She lives on a small horse farm in New Haven with her husband, Stuart, their son, Rider, and two Labrador retrievers. Warm, energetic and intensely committed to her work, Cady has three other children and five grandchildren, though she looks too young to have such progeny. Though Cady’s work is about the outside world, it seems to come from a faraway land inside her own imagination. During a recent visit with Cady, she is clad in a white blouse and trim pants. The tailored look belies her penchant for fantastical colors on canvas. But spending an afternoon with her reveals the drive behind her artwork. 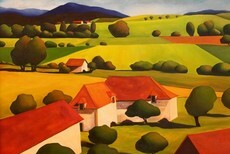 Cady’s landscapes are popular, acquired by more than 600 private collectors around the U.S., Canada, New Zealand and Europe. She says she has a hard time keeping up with commissions and the demand from galleries. One of the latter is Middlebury’s Edgewater Gallery , where Cady will open a solo exhibit, titled “Anne Cady: Twenty Years,” with a reception this Friday. The show coincides with the Middlebury College Reunion Weekend, and Cady will be celebrating her own 40th reunion at the school, as well as two decades of paintings. At the age of 15, Cady says, she started teaching art classes at her home in Darien, Ct., to neighborhood kids. At Middlebury College, she studied printmaking with David Bumbeck. While raising her four children in Vermont, Cady founded and directed the Children’s Art School, which for nearly 30 years provided art classes to children in Pittsford, Woodstock, Reston, Middlebury and New Haven. There is dignity as well as playfulness in Cady’s paintings. They may be inspired by children’s art, but these landscapes are in the hands of a professional. 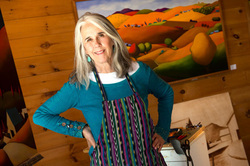 Her paintings are bold and sing with color. Some shout; some are serene. Her clean, distinct edges give order to all the wild colors.